​The RWMG policies require that projects be submitted and approved for the project list before they can be considered for an IRWMP grant application. The process requires stakeholders to carefully plan and document their projects in advance, rather than as a short-sighted response to available funding. 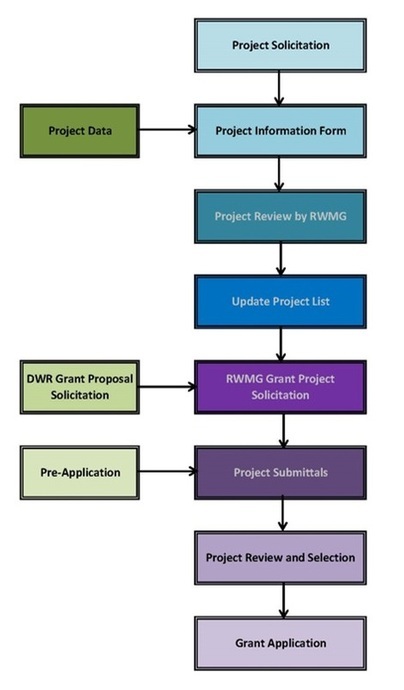 The following three-step process aims to standardize the information submitted by potential project sponsors for efficient review by the RWMG, and ultimately, the successful implementation of SSIRWMP objectives. These steps include 1) Call for Projects, 2) Review by Project workgroup or the Coordinating Committee, approved by the Regional Water Management Group and, 3) Project(s) added to the Project List. This project list is typically updated annually, although projects can be submitted at any time. The process is open to all projects satisfying the criteria previously discussed, regardless of the current status of the project. Projects at the conceptual level are encouraged and will be added to the list as conceptual (Tier 3) in order to prevent duplication of effort and to foster project integration and development, especially if the project encompasses more than one watershed and/or user stakeholder group. Projects must be submitted by a Member or interested party. Project proponents are asked to complete a Pre-Proposal Form and SSRWMG Project Identification Form. The form allows for proponents to include basic information generally associated with State grant applications criteria. Tier 3: Project is conceptual without a proponent and no Project Information Form. Tier 3 Projects are listed to reduce the potential for the duplicated planning and project development efforts and to provide information concerning potential project integration opportunities to develop a regional project. A project list is then generated or updated in which projects are identified based on the primary IRWMP goals and objectives that they will address and the project category (e.g. Study, Best Management Practice). As new projects and project concepts (Information Forms) are submitted by Members or interested parties, the Project Workgroup will add them to the tiered list of Implementation Projects. The list will be adopted by the RWMG at their next regular meeting, will be e-mailed to RWMG members and interested parties, and will be updated on the RWMG’s online project list.